I am 21 years and very passionate about my job I enjoy making other people happy I worked in a nursery and it was my favourite place to be. I have nieces and nephew and a younger sister all of different ages so I enjoy doing different activities with them and taking the younger ones to baby groups etc I love crafts and baking and messy play as these thing bring out happiness in others to and is all about learning and exploring new things I love going for walks and being out doors always find something nice to do outside. 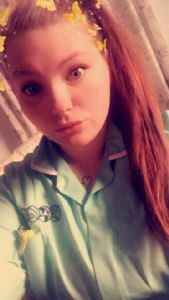 I am very out going and a very bubbly person always good with be flexible with helping other's and work etc too I overall really enjoy making a difference. I have worked as a carer/support worker for two years I worked in a care home for elderly I have worked with EMI dementia and fragile and elderly people I was in charge of a unit with 10 residents and was in charge of making sure personal care meals etc was done right moving and handling was followed correctly and care plans was followed. Promoting independence and encourging independence and ensure and comforting people I have also done end of life care and palliative care.